Vito Andolini Corleone is a fictional character in Mario Puzo's novel The Godfather and in the first two of Francis Ford Coppola's film trilogy. He is portrayed by Marlon Brando in The Godfather and then, as a young man, by Robert De Niro in The Godfather Part II. He is an orphaned Sicilian immigrant who builds a Mafia empire. Upon his death, Michael, his youngest son, succeeds him as the don of the Corleone crime family. He has two other sons, Santino ("Sonny") and Frederico ("Fredo"), and one daughter Constanzia ("Connie"). Vito informally adopts Sonny's friend, Tom Hagen, who becomes his lawyer and consigliere. Vito oversees a business founded on gambling, bootlegging, and union corruption, but he is known as a kind, generous man who lives by a strict moral code of loyalty to friends and, above all, family. He is also known as a traditionalist who demands respect commensurate with his status; even his closest friends refer to him as "Godfather" or "Don Corleone" rather than "Vito". Vito Andolini's story starts in Corleone, Sicily, in the Kingdom of Italy. He was born on December 7, 1892; in 1901, the local mafia chieftain, Don Ciccio, murders Vito's father Antonio when he refuses to pay him tribute. Paolo, Vito's older brother, swears revenge, but Ciccio's men kill him too. Ciccio then sends his men to fetch the boy, Vito. However, Vito's mother begs Ciccio to spare Vito. Ciccio refuses, reasoning the boy will seek revenge as a grown man. Upon Ciccio's refusal, Vito's mother holds a knife to Ciccio's throat, allowing her son to escape while Ciccio's men kill her. Family friends smuggle Vito out of Sicily, putting him on a ship with immigrants traveling to America. Ellis Island immigration officials rename him Vito Corleone, using his village for his surname. He later uses Andolini as his middle name in acknowledgement of his family heritage. Vito is taken in by the Abbandando family, who are distant relations of his, in Little Italy on New York's Lower East Side. Vito grows very close to the Abbandandos, particularly their son, Genco, who is like a brother to him. Vito earns an honest living at the Abbandandos' grocery store, but the elder Abbandando is forced to fire him when Don Fanucci, a blackhander and the local neighborhood padrone, demands that the grocery hire his nephew. In 1920, Vito is befriended by Peter Clemenza and Salvatore Tessio, who teach him how to survive by fencing stolen dresses and performing favors in return for loyalty. Fanucci learns of Vito's operation and demands a cut of his illegal profits or he will report Vito and his partners to the police. Vito then devises a plan to kill Fanucci. During the festival of Saint Rocco, Vito trails Fanucci from Little Italy's rooftops, jumping from one building to the next, as Fanucci walks home. Vito enters Fanucci's building and shoots him dead as Fanucci is unlocking his apartment door. Vito then takes over the neighborhood, treating it with far greater respect than Fanucci did. Vito and Genco start an olive oil importing business, Genco Pura. It eventually becomes the nation's largest olive oil importing company, and the main legal front for Vito's growing organized crime syndicate. Between Genco Pura and his illegal operations, Vito becomes a wealthy man. In 1923, he returns to Sicily for the first time since fleeing as a child. He and his partner Don Tommasino systematically eliminate Don Ciccio's men who were involved in murdering Vito's family and arrange a meeting with Ciccio himself. Vito carves open the elderly Don's stomach, thus avenging his family. Tommasino takes over the town and is the family's staunchest ally in the old country for the next half a century. By the early 1930s, Vito has organized his criminal operations as the Corleone crime family, one of the most powerful in the nation. Genco Abbandando is his consigliere, and Clemenza and Tessio are caporegimes. At the same time Vito has his personal family; his wife, Carmela, four sons (one adopted) and a daughter. As a boy, Vito's oldest son, Sonny, brings his homeless friend, Tom Hagen, to stay with the Corleones and Vito unofficially adopts him. As an adult, Sonny becomes a capo, Vito's heir apparent and de facto underboss. Fredo, Vito's second-born son, is deemed too weak and unintelligent to handle important family business and takes on only minor responsibilities. Vito has a difficult relationship with his youngest son, Michael, who wants nothing to do with the family business. Michael enlists to fight in World War II against Vito’s wishes; when Michael is wounded in combat, Vito pulls strings to have him honorably discharged and sent back to the U.S., without Michael’s knowledge. Around 1939, Vito moves his home and base of operations to Long Beach, New York on Long Island, where Genco serves as Vito's most trusted adviser until he is stricken with cancer and can no longer fulfill his duties. Hagen, who by now has become a practicing attorney, takes Genco's place. Vito prides himself on being careful and reasonable, but does not completely forsake violence. When his godson, singer Johnny Fontane, wants to be released from his contract with a bandleader, Vito offers to buy him out, but the bandleader refuses. Vito then makes the bandleader an "offer he can't refuse": he threatens to kill him unless he releases Fontane for a much smaller sum. Later, when movie mogul Jack Woltz refuses to cast Fontane in a film role that could rejuvenate his waning career, Vito's men kill Woltz's champion racehorse and place the severed head in Woltz's bed as he sleeps as a final warning. In 1945, heroin kingpin Virgil Sollozzo asks Vito to invest in his operation. Sollozzo is backed by the rival Tattaglia family, and wants Vito's political influence and legal protection. Vito declines, believing the politicians and judges on his payroll would turn against him if he engaged in drug trafficking. During the meeting, Sonny expresses interest in the deal. After the meeting, Vito reprimands his son for letting an outsider know what he was thinking. Around Christmas, as Vito crosses a street to buy oranges from a vendor, Sollozzo's hitmen emerge with guns drawn. Vito bounds for his Cadillac, but is shot five times. Fredo, who had been accompanying Vito, fumbles with his gun and is unable to return fire as the assassins escape. Vito survives, and Sollozzo makes a second assassination attempt at the hospital. Mark McCluskey—a corrupt police captain on Sollozzo's payroll—has removed Vito's bodyguards, leaving him unprotected. However, Michael arrives moments before the imminent attack. Realizing his father is in danger, Michael and a nurse move Vito to another room. Michael affirms his loyalty at Vito's bedside. While Vito recuperates, Sonny serves as acting head of the family. Michael, knowing his father will never be safe while Sollozzo lives, convinces Sonny that he can murder Sollozzo and McCluskey. Michael kills both men and is smuggled to Sicily under the protection of Vito's friend and business partner Don Tommasino. 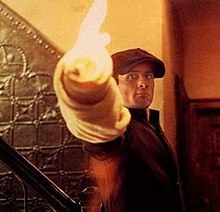 The deaths of Sollozzo and McCluskey ignite a war between the Corleone and the Tattaglia families, with the other New York families backing the latter. After Sonny is killed by Barzini's men, Vito resumes control and brokers a peace accord among the families, during which he realizes that Barzini masterminded the attempt on his life and Sonny's murder. Michael returns home to become Vito's heir apparent. Michael marries his longtime girlfriend Kay Adams, and Vito semi-retires, making Michael the operating head of the family—something Vito had never wanted for his favorite son. Vito becomes his informal consigliere, displacing Hagen. Michael persuades Vito that it is time to remove the family from the Mafia. At the same time, Michael and Vito secretly plan to eliminate the other New York dons, while allowing them to whittle away at Corleone family interests to lull them into inaction. Vito warns Michael that Barzini will set Michael up to be killed under the guise of a meeting; Barzini will use one of the Corleone Family's most trusted members as an intermediary. Shortly afterwards, on July 29, 1955, Vito dies of a heart attack in his garden while playing with his grandson, Michael's son Anthony. In the novel, his last words are, "Life is so beautiful." At Vito's funeral, Tessio inadvertently reveals that he is the traitor when he tells Michael that Barzini wants a meeting and that he can set it up on his territory in Brooklyn, where Michael would be safe. Days later, Michael eliminates the other New York dons in a wave of assassinations. Tessio and Connie's abusive husband, Carlo Rizzi, are also murdered for conspiring with Barzini. In one stroke, the Corleone family regains its status as the most powerful criminal organization in the country. Vito appears in both The Godfather Returns, Mark Winegardner's 2004 sequel to Puzo's novel and The Family Corleone, a 2012 novel by Ed Falco. These novels explore his rise to power in the 1920s and 1930s and his early relationships with his wife and children. 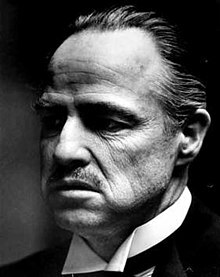 In The Godfather, Don Vito Corleone was portrayed by Marlon Brando. He was portrayed as a younger man in The Godfather Part II by Robert De Niro. Both performances won Academy Awards — Best Actor for Brando, Best Supporting Actor for De Niro. Vito Corleone is the only motion picture character played by two different actors to be awarded an Oscar for both portrayals. Brando declined his Oscar, having Sacheen Littlefeather state his reasons during the awards show. Premiere Magazine listed Vito Corleone as the greatest film character in history. He was also selected as the 53rd greatest film character by Empire. The character has also had a major influence on entertainment, most notably: the movie The Freshman, where Marlon Brando's character is a parody of Vito Corleone; the Only Fools and Horses episode "Miami Twice", where the primary antagonist is Don Vincenzo "Vinny the Chain" Ochetti, another parody of Vito Corleone. In the 1993 Mel Brooks film Robin Hood: Men in Tights, the Sheriff of Rottingham meets with Don Giovanni (played by Dom DeLuise) who is a parody Marlon Brando's performance of Vito Corleone, to arrange the assassination of Robin Hood. The Disney animated film Zootopia, features a character named Mr. Big, an anthropomorphic arctic shrew and a crime boss who shares mannerisms and a similar appearance with Vito Corleone; and the comic book mini-series, Batman: Year One and Batman: The Long Halloween, where the character Carmine Falcone is loosely based on Vito Corleone. Goodfeathers, a segment of the cartoon show Animaniacs, features a character called "The Godpigeon", a parody of Vito Corleone. Vito Corleone is based on a composite of mid-20th century New York Mafia figures Carlo Gambino, Frank Costello, Joe Bonanno, and Joe Profaci. ^ "100 Greatest Movie Characters of All Time". Premiere. New York City: Hachette Filipacchi Media U.S. Retrieved February 27, 2012 – via filmsite.org. ^ "The 100 Greatest Movie Characters| 10. Vito Corleone". Empire. London, England: Bauer Media Group. December 5, 2006. Retrieved February 27, 2012. ^ Schladabeck, Jessica (August 24, 2016). "A look at the Gambino Crime family tree, from their early roots to serving as inspiration for 'The Godfather'". The New York Daily News. New York City: tronc. Retrieved January 23, 2019. ^ Ferranti, Seth (June 18, 2018). "Meet the Unconventional Mafia Boss Who Inspired 'Godfather' Don Corleone". Vice. New York City: Vice Media. Retrieved January 23, 2019. ^ Reed, Christopher (13 May 2002). "Obituary: Joe Bonanno". The Guardian. London, England: Guardian Media Group. Retrieved 23 January 2019. ^ Sokol, Tony (March 15, 2018). "The Real History of The Godfather Movies and Book". Den of Geek. London, England: Dennis Publishing. Retrieved January 23, 2019.